Authorities opened both directions of Hwy. 100 in St. Louis Park at 10:15 a.m., 3 hours after the highway was closed when a person threatened to jump off a bridge. Traffic on Hwy. 100 continued to be snarled in the immediate area. The woman who threatened to jump was taken to Hennepin County Medical Center, said St. Louis Park spokeswoman Jacqueline Larson. The incident unfolded just after 7 a.m. when a woman was spotted on the Execlsior Blvd. bridge and authorities shut down both directions of Hwy. 100 in St. Louis Park during Wednesday's morning rush hour. A city spokeswoman said police negotiated with the jumper and were able to resovle the situation peacefully. The incident made a mess for commuters as the highway was closed for northbound traffic at 50th Street and southbound traffic at Hwy. 7. Some motorists were stuck on the highway while others were diverted off onto side streets. 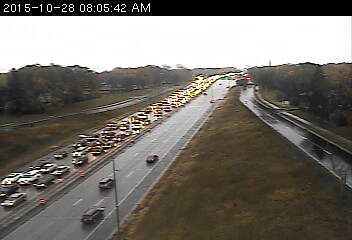 Northbound traffic clogged up at Benton Avenue while southbound crammed up as far north as 36th Avenue N. in Robbinsdale. Those who caught word of the incident and the massive traffic backups found that alternate routes also were plugged up as Hwy. 169, I-494, I-35W and city street absorbed Hwy. 100 traffic. Some motorists were stuck on Hwy. 100 for more than hour until police could direct them off the road. Allysen Hoberg who was caught in the backup said via Twitter that she sat on Hwy. 100 from 7:30 a.m. until 8:45 a.m .